SLIME TIME The film whose trailer is the most disliked in YouTube history (947K thumbs down) turns out to be the smartest sort of silly summer fun. Talk about coming full circle. Or history repeating itself. Or just plain getting old. The original 1984 Ghostbusters was one of the first movies I reviewed as a professional critic. Think of it: 32 years ago. Born five months before its release, Kate McKinnon was literally in diapers. That might seem like a long time, but it's probably just about the right interval to wait before readdressing a classic. Too many films that aren't remotely classics are remade these days, even as the original's still streaming on Netflix. Lara Croft: Tomb Raider (2001), for example. Has the public really indicated its desperate need for a new Croft flick, or is Hollywood just more creatively bankrupt than ever? I digress. The great Paul Feig (Bridesmaids), along with his pretty darn great cowriter Katie Dippold (The Heat), has resurrected, reimagined and rebooted the beloved comedy and done so with both tremendous respect and exemplary finesse. This is a picture with more nice touches than a shiatsu massage. First and foremost, there's the inspired decision to flip the genders of the principals. Feig's films have always maintained that female police officers, high-level government staff and secret agents can be every bit as competent — and loony — as their male counterparts. Why not, then, make them Ghostbusters? Of course, it doesn't hurt to have a cast this hilarious. If there are four funnier females than Kristen Wiig, McKinnon, Leslie Jones and Melissa McCarthy making movies today, they're making them on another planet. These are the queens of comedy. Prudently, the script wastes minimal time on setup. 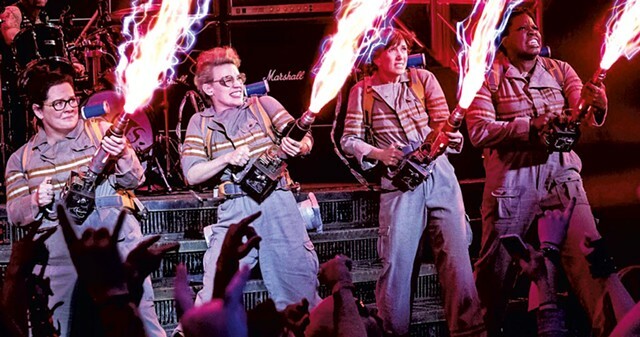 Faster than you can say, "Don't cross the streams," the four women have gone into business together, rented an office over a Chinese restaurant and worked the bugs out of their proton packs. Their outfits are a gift from Jones' Patty, a former MTA employee who presumably figures that if they're going to save New York City, they might as well look like they work for it. Pals Erin (Wiig) and Abby (McCarthy) have always shared a fascination with the supernatural. Jillian (McKinnon) has always been a gearhead. And Patty's just seen a ghost in a subway tunnel and is afraid. She signs on to help wipe out the specters. "Someone's created a device that amplifies paranormal activity," McCarthy discovers — something that's not great for Manhattan but really good for business. This would be a nerd of evil named Rowan North (Neil Casey), whose plan is to unleash an ectoplasmic tsunami on the city. In one of the she-boot's most wonderful scenes, our heroes confront the mayor (Andy Garcia) and plead with him to take action. "Please don't be like the mayor in Jaws," begs Wiig. Needless to say, the effects are more sophisticated than they were in 1984 (if rivers of fluorescent vomit can be described as "sophisticated"), the gadgets are more impressive than ever and the surviving members of the original crew pop by for cameos. The most extended — and funniest — is Bill Murray's. "Is this a good time?" he asks with a smirk, playing a professional debunker paying a surprise visit to Ghostbusters headquarters. Of course, it's always a good time when Murray pops by. The Times Square finale is a thing of CGI beauty, with the four women facing down a delightfully frightful mashup of old and new spooks. Standouts include holdovers such as Slimer, along with more recent developments like sinister Macy's parade balloons. That crucial balance of the old and new is just one of many things the director gets exactly right. From the iconic theme music to the laid-back, take-nothing-too-seriously tone, the DNA of Dan Aykroyd and Harold Ramis' gut buster flows through every frame of Paul Feig's Ghostbusters. Ghostbusters is not showing in any theaters in the area.